The earliest specific documentary evidence of the quarries existence is in 1284 when the name “Delabole” first appears. However, historical evidence of blue/grey slate used on medieval buildings around Cornwall, England and Wales, indicates a quarry was working at Delabole well before the 13th century. By Elizabethan days Delabole was an important producer of slate, with “slate transported throughout the realm”. 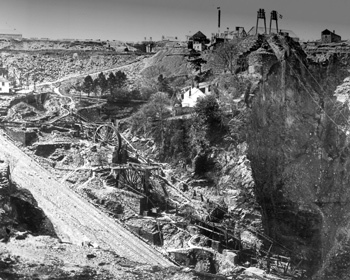 Until the 19th century, the quarry was worked under several individual “leases”, with various different owners and operators running small quarries in the area of the current workings. This method of operation gave rise to many disputes until The Old Delabole Slate Company was formed in 1841 bringing the whole quarry site under single ownership. This organisation became a limited liability company in 1898. The Old Delabole Slate Company had a long and chequered history before finally being liquidated in 1977 by the company's bankers. Mid 1977, the quarry was purchased by Tehidy Minerals, who transferred it to Rio Tinto in 1984. This “corporate” era was short lived and in June 1999, the General Manager, George Hamilton, led a management buy-out returning the quarry to local ownership. 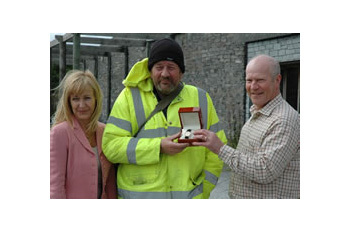 During 2005 the minority shareholder was bought out by the Hamilton family who are now sole owners of The Delabole Slate Company Ltd. 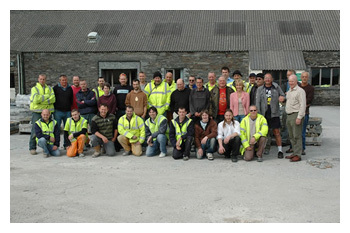 The Delabole Slate Company Ltd is now, once again, a private Cornish company. It is owned and managed by the directors and our registered office is Pengelly, Delabole, Cornwall. The company is run on a "family firm" basis and currently employs 32 people. We are specialist producers of bespoke and traditional slate products for the building and home improvement sectors, offering a friendly service to both the public and trade. Employ local people. 80% of our team come from the "walk to work" area of Delabole. Support the local economy. We buy locally where appropriate. Be a "good neighbour" in working alongside the local community. Adding new products to reduce "waste mineral". Linking with tourism through a visitor centre.